So this weekend I decided I would get my bake on. I actually made this recipe a while back with traditional ingredients, but this time I tried to sub in some healthier ingredients. I was really impressed with how these cookies turned out, as they were a lot nicer than the first batch I made. 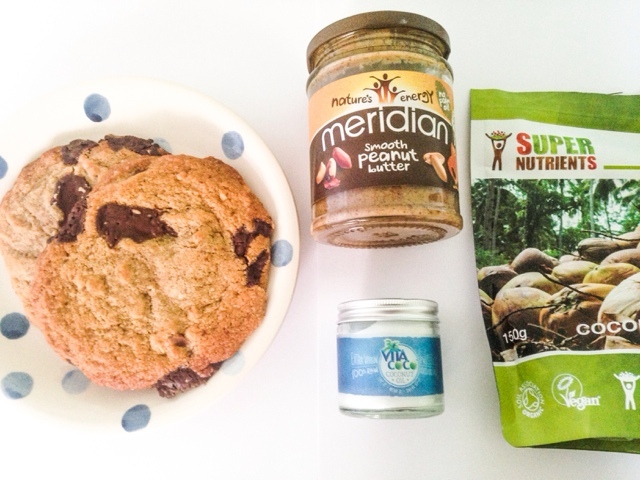 My healthy peanut butter cookies are soft and squidgy with indulgent chocolate chunks. 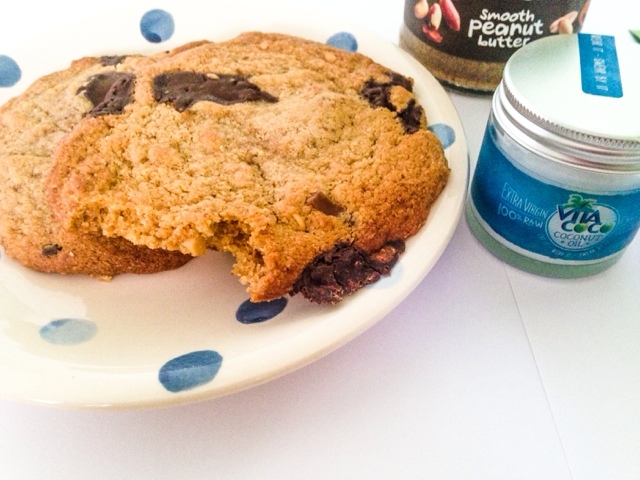 There's an addictive hint of coconut with a moreish hint of sea salt. 1) Start by measuring out your coconut oil. Put it in a mug and melt it in the microwave. About 30 seconds will do it. 2) Put the coconut sugar in a mixing bowl and combine it with the melted coconut oil. 3) Beat in an egg, vanilla extract and the peanut butter. I actually used the chunky variety, as I like the crunch, but you can always use smooth and add in some crushed nuts. 4) Fold in the ground almonds and salt. If the mix is too dry, add a splash of almond milk. 5) Break in the chocolate. 6) Line 2 baking trays with foil and divide the mix into 6 blobs. I put 3 on each tray as they spread quite a bit. 7) Bake for 11 mins at gas mark 6 until golden around the edges. 8) Leave to cool for 30 mins. The ground almonds and coconut oil mean that the middle stays relatively soft, even when cooled, and reminds me of the centre of Reese's Peanut Butter Cups! These look great, will definitely be giving them a go! Which coconut oil do you recommend? Thanks! Damn right they do! I'm not a fan of the subway cookies. I'm convinced they gave me food poisoning once haha. These look so tasty. I'm going through a phase of really loving peanut butter. They're awesome, I definitely need to make these again :) thanks Hayley!